Thousands of accounts are hacked daily. You might have heard many reports about this. It's not necessary that hackers will target officials and celebrities only. Sometimes, normal people are also hacked and their accounts are usually used for spam purpose. Today you're safe and you can't guarantee what will happen to you in the next moment. Maybe you'll be hacked and all your hard work and private details will be in wrong hand. To keep your digital life on a safe side, you've to choose a strong password for all your social accounts and this is the very first step. Strong means that isn't easy to hack. Speaking frankly, around 70% of people don't know what should be the right password and it's due to their carelessness, why they are hacked easily. Here I will guide you how to create a strong password for your social accounts. In the next section, we'll discuss on other ways by which you can keep your account safe and secure. Now lets start. While creating a new password, you've to keep all these little things in your mind. After finding it, immediately change your account passwords before it's too late and you'll be hacked. Hard to guess and hack: Your password should be hard to guess so that no one can hack it easily. In most common cases, if the hacker know you in real life, he will try to guess some random passwords and use them to login to your account. Some people use very weak passwords like their real name, pet name, favorite song, girlfriend name etc., They are easy to guess. Right? So make sure that you're not doing the same mistake. Apart from guessing, advanced hackers also use automated bots, phishing websites and other ways to hack account. Create a complex password: No doubt, complex passwords aren't easy to hack. Remember that, the more complicated your password will be, the more hard it will be to hack into your account. It may be hard for you to remember it but they are actually safe. To create a complex password, you've to think a little different. Adding a complete sentence or words isn't good. You can select first alphabets from each word and use them in capital and small letters. For example, If my favorite car is Rolls Royce, I can write it as "MfciRRoYce". More than 10 digits: Small length password can be hacked easily by automated bots. Your password should be more than 10 digits at least. At the time of changing it, you may find a password strength status side by side in some websites. This strength is directly proportional to the length. Use both capital and small letters: As you can see in above example, I have used a combination of small and capital letters which is very important. Lets take two examples. Tell me which is a good password - "iloveindia" or "IloVeIndiA". Although both have same words but second one is more strong, of course. Even if the hacker will guess the right password accidentally, he won't be able to access your account because you're using capital and small letters in it and he actually don't know which character is capital and small. Thus, he may skip it and try other passwords. Add at least one number and special character: Your password must have numbers and special characters in it, at least one. Please note that, don't use your mobile number, date of birth and other common things. To make it simple, add only 2-3 numbers at the beginning, end or in the middle of the password. On the other hand, you should also use special characters in it. For example, you can add space to separate two words. Many websites don't allow to use spaces in password. In that case, you can add underscore (_) or hash sign (#). There are other special characters also like dot, comma, maths operators, backslash, brackets etc., Some keyboards don't have advanced special characters and thus you can't be able to type them in password field while logging into your account. So make sure that you're using common characters only. 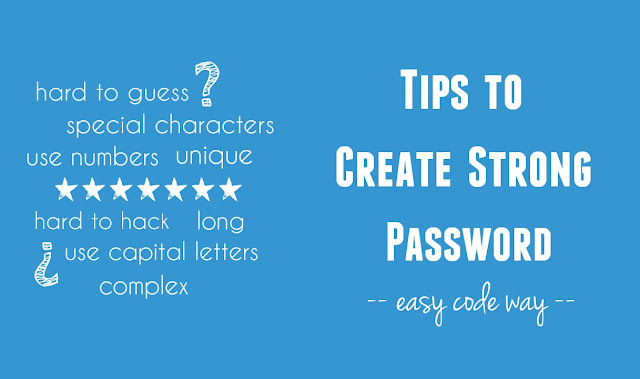 Create a password that you can easily remember: Although I have mentioned a word "strong" in above title but this doesn't mean that your password should be too much hard to remember. Create a unique combination that only you can remember and no one else. Don't use third-party tools: Some people use third-party tools to generate random passwords for their social media accounts. This isn't a good idea. I don't recommend using any third-party application as they may hack your account. You have your own mind. So just use it and create your own password. Use different password everywhere: Many people keep same password in all their social media accounts. This isn't safe. Think it in this way. For instance, if your Gmail account is hacked, hacker will first try to access your other accounts with the same email address and password. If you're using same password everywhere, you'll lose other accounts as well. However, it's not an easy task to create separate passwords and then manage them simultaneously. You can make little changes in your primary password by adding 1-2 numbers or special characters at its end or beginning. Don't share your password with anyone: Keeping your password safe is in your hands. Don't share it with anyone. If you've written it on paper or saved it in a text file, make sure that it is safe and only you can view it. If someone is asking you to give your account details, please ignore all such messages, even if they pretend to be an official. Logout your account: If you're using a public computer like cyber cafe or your company laptop, make sure to logout your account after using it. Clear browsing history: Some browsers will automatically save your account login details like email address and password. Again if you're not using your personal computer, you should clear all its browsing history to delete site cache and cookies. Update your password periodically: You should not use same password for more than 2 months. Periodically, make little changes in it and keep track of all the devices and browsers, where your account is logged in. Check URL before login: Some hackers use phishing websites to save your email address and password. Such websites look same as the original but actually they are fake. Once you'll enter your account details, it will send them to the hacker and you'll hacked easily. There is simply tricks to prevent this attack. When you're typing your private information on any website, first check its URL careful. Is it correct? If yes, then refresh the page and check it once again. If it's right, you can continue. Add a 2-step verification process: Last but not least, you can enable 2-step verification in your account. This will add an extra security layer. When this feature is enabled, you'll be asked to give a security code along with the normal password. This security code is a 6-digit number which is sent on your registered mobile number each time when someone (you or the hacker) will try to login. As name itself speaks, 2-step means you've to pass 2 security checks. First one by entering the real password and second one by entering this randomly generated security code. I had already discussed this topic in my previous article and you can read complete guide on how to enable this 2-step verification in your Google account. This is all what you need to know about password security. If you've any doubts, feel free to drop them in below comment box. Stay tuned for more interesting tutorials. Did I had missed something?